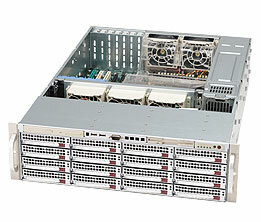 Acme AG-316EF 3U Opteron 6200/6300 database server. AMD Opteron 6200/6300 with 3U rackmount black. Up to 256GB of DDR3 memory. DDR3 1333/1066/800 MHz Registered ECC SDRAM or Unbuffered ECC/non-ECC 72-bit, 240-pin gold-plated DIMMs. Include Hardware SAS RAID controller (LSI 8704EM2 with cache memory, plug to PCI-e slot) connects 16 SAS/SATA hard disk drives. Matrox G200 16MB DDR2 VGA video controller. No IDE, no floppy port. 1 PCI-e x8 (in socket x16) slot. 1 PCI-e x4 (in socket x8) slot. 16 of SATA/SAS hot-swap bays, SAS RAID card, SAS/SATA backplane included. 1 slim CD bay, 1 slim FDD bay. 700W power supply included, option to add a 700W power module for redundant hot-swap function. * CPU, memory, HDD are not included. ** option to change DC 48V input power supply.